This recipe yields 15 croissants, and the total time it needs is about 2 to 3 hours across 3 days, with overnight refrigeration. On the first day, combine all dough ingredients in a stand mixer equipped with a dough hook. On low speed, mix for about 3 minutes, making sure to get the dough stuck on the sides of the bowl. For the next 3 minutes, mix on medium speed. Lightly flour a dinner plate or a 10 inch pie pan, and transfer the dough. Sprinkle flour on top of the dough, cover tightly with plastic wrap and place in the refrigerator overnight. On the second day, cut the butter by length into slabs about ½ inch thick. Lay out the slabs on parchment or waxed paper in a square of about 5 or 6 inches. Cut the butter wisely if needed. Place another sheet of parchment or waxed paper on top, and use light and even pounding strokes with a rolling pin to encourage adhesion among the pieces of butter. Use stronger pounding strokes as the pieces come together. Once the square becomes about 7½ inches around, trim the edges and place the scraps on top, rolling them lightly back into the butter square. Refrigerate. Lightly flour your workspace to prevent the dough from sticking. 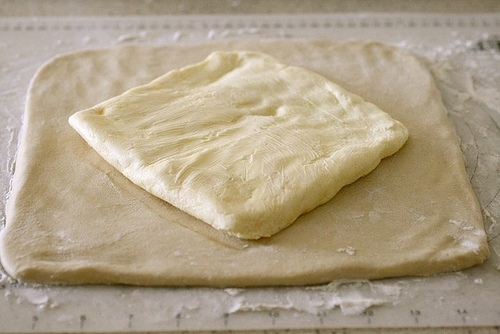 Lay the dough down and roll it into a 10½ square. Excess flour on the dough should be brushed off. Take your butter out of the refrigerator and it should be cold but moldable at this point. If not, refrigerate it a little big longer. Place the butter in the center of the dough, with the corners of the butter centered on the sides of the dough square. Fold all of the dough flaps over the butter and stretch it slightly to reach the middle. Press together all the sides of the dough to make sure it is completely sealed. Sprinkle some flour on the top and bottom of the dough and press it firmly towards a more rectangular shape. Keeping straight edges and square corners, roll the dough to elongate it until the rectangle is 8x24 inches. Brush off excess flour. Fold the dough from the short end over, leaving one third of the end exposed, brush off flour and fold the other end over the first folded piece. Place it on a baking sheet, covered with plastic wrap. Place in freezer for 20 minutes. Remove from freezer and repeat the same rolling and folding method. Repeat the process three times. Then cover tightly with plastic, making sure all ends are sealed, and place in the refrigerator overnight. On the third day, unwrap the dough and lightly flour both sides. Using the rolling pin, firmly press the dough lengthwise without widening. Roll the dough into a long rectangle, 8x44 inches. Use more flour if the dough is sticky. If the dough becomes resistant to stretching, fold into thirds, cover and refrigerate for 10 minutes. Then unfold it again and continue the rolling process. Make sure there is excess dough on the ends so it can be trimmed with straight edges to 40 inches. Using a yardstick or measuring tape lengthwise, take a knife and mark the dough every 5 inches along the top. Along the bottom, starting 2½ from the edge, make marks every 5 inches again so that the bottom marks are halfway in between the top marks. Cut the dough with a pizza cutter or knife diagonally, starting from the top corner to the first bottom mark. Carry on across the dough, cutting at the same angle. Then start from the other end and change the angle to cut into long triangles. Now you will have 15 triangles and a bit of dough left over. 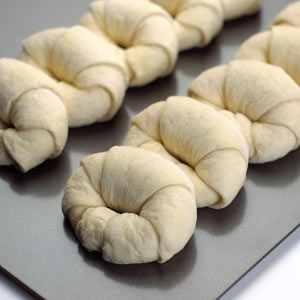 Mastering the art of the crescent shape will prove that you are truly skilled in how to make croissants. Take one triangle and cut a small notch into the short end at the center. This will encourage the classic crescent shape of croissants. Stretch the triangle to about 10 inches. Lay the triangle down with the short side facing you. Place hands on either side of the notch and roll away from you, spreading your hands outward as you roll to elongate the shape. Without compressing too much, use just enough force to allow the layers to stick together. The pointed end should land underneath the roll. Bend the legs of the croissant towards you in the shape of a crescent and press the legs together. Place on baking sheets lined with parchment paper with ample space in between each croissant. Use two baking sheets to spread the croissants out well. Whisk your egg with 1 teaspoon of water to make smooth egg wash, and brush lightly onto each croissant. Refrigerate the rest of the egg wash. Be sure the room temperature isn’t too warm, as the butter can melt. After 1½ to 2 hours, the croissants will be fully proofed, appear larger, and you will be able to see the layers of dough from the side. 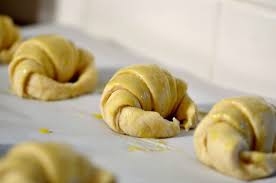 Brush the proofed croissants again with the egg wash and place baking sheets in the oven. Preheat a convection oven to 400°F, or 425°F for a conventional oven. Rotate and alternate sheet positions after 10 minutes. Watch the croissants as they bake, make sure the bottoms are evenly browned, and then leave for another 8 or 10 minutes until the top is rich and brown and the edges are changing color. Lower the temperate by 10° if the croissants are browning too quickly. At last, remove from oven and let cool on the baking sheet on a cooling rack. Sprinkle powdered sugar atop your cooling croissants for extra sweetness. Savory croissants are delicious as well. To make a cheesy croissant, cut open the baked croissant, stuff with cheese and butter, and then reheat at 475°F. Don’t let your croissants go stale! Gobble them up when they are freshly baked or on the same day. Rounded, crescent-shaped croissants are great for making sandwiches later. Custard cream and chocolate are a great filling as well, or you can spread honey on the inside while the croissants are still warm.